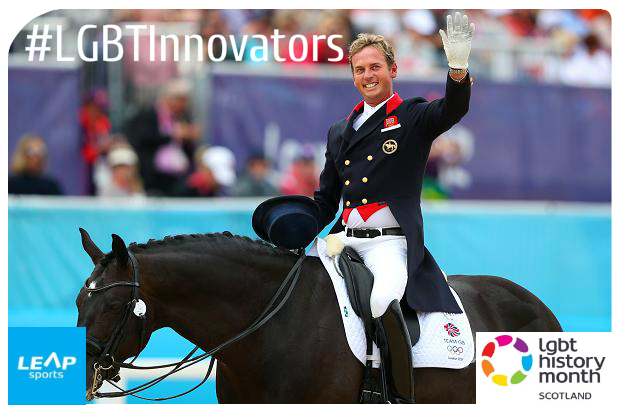 #LGBTInnovators - Dressage Rider Carl Hester | LEAP Sports Scotland MBE is a British dressage rider. "> MBE is a British dressage rider. In 2011 Hester riding the horse Uthopia was part of the British team that won the team gold medal at the 2011 European Dressage Championship in Rotterdam. Hester also won individual silver medals in the Grand Prix Freestyle and Grand Prix Special. Competing at Olympic level Hester became the youngest British rider ever to compete in an Olympic Games. He was also Britains only openly gay Olympian. At the 2012 London Olypics Hester won a team gold. The team, which included Laura Bechtolsheimer and Charlotte Dujardin, celebrated the country’s twentieth gold medal of the games, strengthening the host nation’s place third on the board. “To come to an Olympics where we were expected to get a gold gave me a frightening feeling – and I enjoyed it. Written on 27th February 2016.